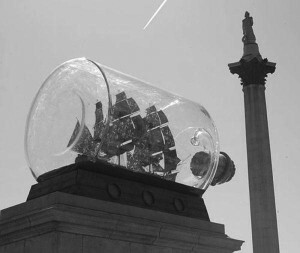 The National Maritime Museum in Greenwich has bought for £362,500 the ship in a bottle by Yinka Shonibare which had sat ornamentally becalmed on the fourth plinth in Trafalgar Square for the previous 18 months. It is the Greenwich museum’s job to collect ships and related tackle and, lately, any sea-related nonsense deemed ‘challenging’ by State Art’s omniscient spivs. It is significant, if you hadn’t realised, that the ship’s sails are made from patterned ethnic material of the sort usually swathed around gigantic arses in Dalston market. This encourages what one of the Tate’s finest drivellers grandly declares as “a transformation of perception”. Elsewhere, the same stuff is said to make an incisive comment on Britain’s nasty maritime heritage, “an exploration of colonialism and post-colonialism” no less. Needless to say we are not informed into what our “perception” is “transformed”, nor how “colonialism” is “explored” by deploying some patterned swatches purchased from a Brixton stall. I suppose we must now accept this species of commentary as the naturally occurring guff which will in perpetuity follow conceptual art wherever it goes. 1. We are never told the whole truth, even by public relations’ companies paid to deal with inquiries, and especially concerning the actual cost of anything. State Art is terrified of you knowing the truth, which is the reason why so frequently it is caught out lying. 2. Obtaining accurate and complete information from arts bodies requires Kafkaesque determination and, when finally a morsel is vouchsafed, it is always uncooperatively partial and might easily contradict what has been released before. 3. State Art has to be secretive in order to make the public believe that the visual arts are kept cruelly on the breadline and are not, as is the truth, awash with quite staggering amounts of cash which miraculously come available for the right people. If you are a Yinka Shonibare, with access to the engines of State Art, whose institutions you have dutifully served, this system is a licence to print money. 4. The number of bodies dealing with contemporary art is far too numerous and wastefully duplicating of effort and resources, and any independence in their policies and actions is compromised by frequent interchange between them of the same few personnel. Three issues ago Moping Owl asked why we needed to buy Shonibare’s ship when, she thought, we already owned it. Didn’t we? Had we not already commissioned and paid for it to sit on the plinth? Well yes, sort of. Owl’s was a natural mistake, especially in view of what we had already been led to believe by what, up to that point, we now know had been an economical rationing of information. £362,500 is three times the record price paid at auction for any work by Shonibare. To pay apparently so much over the odds is surely just a little questionable, but the truth is that this figure is nowhere near what was actually paid for it. The real price far exceeded the published number, but you won’t have found the full, accurate cost in any newspaper because even now we can’t be certain we know all the amounts involved. As far as I can ascertain at least three additional sums that were paid have not been included in this final account. The Arts Council awarded £70,000 for this project, as it does for all fourth plinth commissions; the Greater London Authority, in addition to its £140,000 production costs, gave an “artist’s fee” of £30,000; and the Henry Moore Foundation gave a grant of £20,000 to the artist for this project. In the privileged wonderland of State Art these additional sums, a mere £120,000, are pocket money. But we still paid them, and the total involved is five times the average Briton’s annual income. I can see no reason why these omitted additional sums should not have been deducted from the price paid by the Museum. Why were they not included in the reckoning? And how many other charities, trusts etc., contributed amounts which disappeared into the coffers when first the project was mooted? The £140,000 contributed by the Mayor’s office for production costs was, according to the initial agreement, to be repaid if the work sold. This is apparently true of all works made for the plinth, though we are unaware of any sums ever having been repaid from previous occupancies.We must assume that Boris is sat waiting eagerly for his refund (after all he can buy one-tenth of a new Routemaster for £140,000). Despite repeated requests for information nothing remotely resembling candour has emerged from the Mayor’s office. The fact is that the GLA alone paid Shonibare in production costs and fees a sum far is excess of the highest amount the artist’s work had ever previously sold for. And we didn’t even get to own it. Is the Arts Council’s £70,000 equally reimbursable upon the sale of a work? If not, it should be. The Arts Council, perennially bleating about its poverty, should surely be on the case for a return of its investment. As usual our requests to them for information have been ignored. They are far too busy producing worthless pamphlets of self-congratulation. The price paid by the NMM was independently assessed by Haunch of Venison and Roche Court, a minor secondary market sculpture dealer in the West Country. Haunch of Venison is a gallery owned by Christie’s who, coincidentally, sold the previously highest priced work of Shonibare, a large installation, for $194,500 last November. (Another installation was sold by Christie’s in April this year for as little as $98,500.) It is hard to see how any objective person could have verified a price of £1.25 million ($1.94 million) for a sculpture by this artist, even one which had sat prominently hawking itself in the centre of London for the previous year and a half. Given that they have a monopoly of sale on Shonibare’s sculpture (Sotheby’s has never offered a work by him) it was not in Christie’s – of course I mean in Haunch of Venison’s – interest to undervalue this piece. In other walks of life we might call this a conflict of interest. Shonibare was handsomely reimbursed twice for this bottle; once when he made it and a second time when he sold it. Additionally, we had a right to expect a knockdown price from the 50-year-old artist whose career has been generously supported by the State. Shonibare is an executive member of the Usual Suspects Club. He was nominated for the Turner Prize in 2004, the year Jeremy Deller won (Deller, incidentally, is one of two artists on the selection committee for the Fourth Plinth, both of them Turner Prize winners). His fledgeling career was made easier by cash grants from both the Arts Council and the Greater London Arts Board and he has enjoyed exhibitions in virtually every Arts Council-funded gallery throughout the country, as well as at the Tate. He has also served on Arts Council committees and bought works of his choice for the Arts Council collection. His present visibility would have been inconceivable without expensive public promotion. This should have been reflected in the price for the bottle. After all, we didn’t owe Shonibare anything, quite the reverse. He has made a strong career on the back of crucial public investment in him and, in my view, he has used that reputation to inflate the bottle’s price when selling it back to us. What a marvellous system this is if you are, as the Arts Council put it, “the right kind of artist”. When the work’s sale to Greenwich was completed Shonibare said: “I am absolutely delighted and touched by the public’s generosity.” I bet he is.